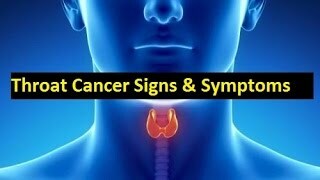 Throat cancer refers to the condition in which a tumor or grown tissues are developed in throat. Throat includes the area of mouth starting behind nose and ending at neck covering voice box as well as tonsils. A tumor in the throat may affect the speaking and swallowing ability of the patient even after treatment and surgeries. Sometimes this tumor is removed with the removal of the affected part while in less severe conditions burning the tumor may solve the problem. 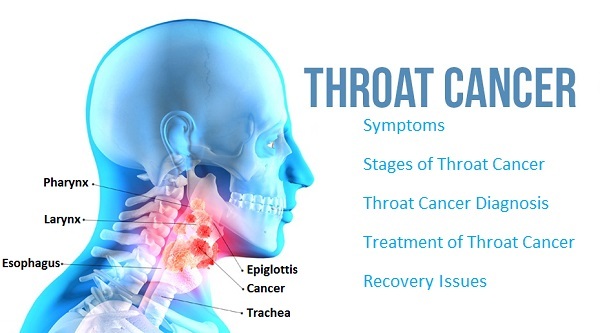 Throat cancer is difficult to diagnose at its early stage as the symptoms associated are normally seen in minor throat problems. Doctors generally do not go for high tests and scans only considering symptoms but if he finds the history of cancer in the family of patient or patient is in severe pain then as a precaution can ask for some tests and scans. In Lyngoscopy a detailed examination of the throat of the patient is done with special equipments under the supervision of specialists. Lyngoscopy describes the keen details about larynx with the help of a camera in order to find the accurate condition. If the results show discrepancies then doctor may recommend biopsy to ensure throat cancer. Biopsy is the procedure of obtaining cells from the affected areas by a surgeon in assistance of radiologist to test presence of cancer. In case of throat cancer biopsy can be done in two ways. Doctor may choose simple incision method to remove a tissue piece, in which a piece of tissue is extracted with the help of a needle. Other method adopted for larynx biopsy is by taking a thin piece directly from the tumor with the help of thin needle. Biopsy can also be done through endoscopic tube in this case. X-Ray, CT scan, MRI or PET any technique can be used to scan the tumor inside the throat and esophagus depending on the stage and condition of the patient. In some cases barium test is also done where patient is asked to intake a liquid thick enough to make a coating over esophagus and throat. This coated barium helps in providing a clear picture of throat while X-ray. Throat cancer once diagnosed needs to be passed through surgery or radiation depending on the condition or stage of the disease. Other factors that determine the mode of treatment are age, immunity power of the body and other disease the patient is suffering from at that time. Studying the entire important factors doctor suggests the best way to help patient getting rid of the problem. Radiation is the effective method used by the doctors to burn cancer cells in early stages of the disease. Radiation waves are pointed directly at tumor or surrounding area to burn it. This method is effective to kill the tumor that is not expanded to large area and can be killed directly. In some stages if needed doctor my suggest a surgery to remove the parts affected by throat cancer. The parts are removed to stop expansion of the cancer cells across the other parts of the body. Depending upon the condition doctor can remove voice box, larynx, lymph nodes of throat or any other part of the throat affected through surgical procedure. Chemotherapy is the widely used method to treat cancers of all types also throat cancer. Chemotherapy is suggested if the tumor is large in size or has covered a wide area inside the body. The procedure involves injection of special drugs having the ability to kill the cells of cancer. These drugs have the ability to attack beta cells of cancer as well as increasing immunity against these cells. Targeted therapy is the best approach to fight against cancer cells as it interferes the growth of malicious molecules that can cause cancer by controlling their growth. This approach uses special substances or drugs that attack cancer cell having less harm to normal cells. Some therapies have the ability to block the certain molecules, enzymes and proteins that assist cancer cells to grow and spread. Normally this therapy is associated with radiation and chemotherapy for better results. Chelidonium is the best medicine in homeopathy to cure the cancer of mouth, throat and stomach. It helps in relieving pain and other symptoms of throat cancer as well as fights the cells of cancer. Condurango is the most suitable medicine for throat cancer if the cancer has affected esophagus as well as has reached stomach. This medicine leaves no need of removing part affected with cancer as it can fight against these cells and destroy.